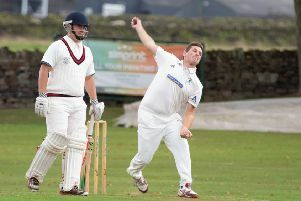 Tough conditions were reflected in the scores at the second Halifax-Huddersfield Alliance meeting of the winter season at Meltham on Tuesday. None of the pairs managed more than 41 points in the wind. However, half of a good entry of 38 pairs finished within three shots of the winners. There was a tie for first place in the pro-am between James Ward and Jonathan Binns (4) of Dewsbury District and Toby Garrett and Richard Hanson (5) of Crosland Heath on 41 points. The highlight for the Dewsbury pair was a nett eagle for Binns on the 13th. Garrett was returning to the course where he was nurtured as a junior and he and Hanson had a very tidy card, spoiled by a costly dropped shot on the eighth. There was an eagle for Woodsome Hall assistant Adam Durie on the 11th and a nett eagle by Graham Thornton of West End at the 12th. The home club’s Chris Holmes (8) and Roy Johnson (18) won the am-am with 40 points thanks to nett eagle on the 14th by Johnson. (11) of Crosland Heath and Bradley Hall came next. Cliff Froggett (20) of Bradley Park had two nett eagles, at the 14th and 17th. The Meltham course was in fine condition with the greens quite fast, having been freshly cut and “ironed”. Two teams of five pairs will represent Halifax-Huddersfield at the National Alliance at Chesterfield Golf Club on Monday. The next local Alliance is at Dewsbury District on Tuesday, October 16. Scores - pro-am: 1, J.Ward Pro & J.Binns 4 (Dewsbury) 41 pts; 1, T.Garrett Pro & R.Hanson 5 (Crosland Heath) 41; 3, J.Fish Pro & S.Summers 5 (Meltham) 40; 4, R.Booth Pro & S.Bradley 16 (Outlane) 39; 4, K.Gaskell Pro & R.Robinson 13 (Crosland Heath) 39; 6, A.Durie Pro & Mike Clark 20 (Ind.Woodsome/Meltham) 38; 7, D.Arber Pro & G.Thornton 19 (West End) 37; 8, S.Race Pro & N.Gleeson 20 (Meltham) 35; 8, N.P.Hirst Pro & M.McGrath 12 (Dewsbury) 35; 10, R.Lambert Pro & C.L’Estrange 11 (Crosland Heath) 33. Am-am: 1, C.Holmes 8 & R.Johnson 18 (Meltham) 40 pts; 2, A.Holmes 12 & C.Adams 13 (Meltham) 39; 3, B.Kaye 4 & H.Dews 16 (Bradley Park) 39; 4, O.Shaw 4 & O.Hague 11 (Crosland Heath/Bradley Hall) 39; 5, M.Francis 20 & S.Beetlestone 15 (Meltham) 38; 5, R.Berry 12 & J.Garlick 7 (Meltham) 38; 5, R.Speight 6 & F.Speight 9 (Dewsbury) 38; 8, D.Delooze 19 & J.Clay 12 (Crosland Heath) 37; 8, T.Baier 15 & N.Paxman 8 (Meltham) 37; 8, K.Short 15 & S.Briddon 19 (Meltham) 37; 8, M.Dempsey 11 & P.Newey 16 (Ind.Huddersfield) 37; 8, C.Moorhouse 10 & A.Lawton 8 (Crosland Heath) 37; 8 N.Ward 8 & R.Scriven 16 (Meltham) 37; 14, P.Ford 21 & D.Taylor 15 (Outlane) 36; 14, P.Smith 19 & N.Witty 16 (Bradley Park/Dewsbury) 36; 14, B.Page 19 & C.Froggett 20 (Bradley Park) 36; 17, P.Ledgard 14 & R.Matthews 7 (Dewsbury) 35; 18, E.Pearson 16 & M.Clark 18 (Crosland Heath) 34; 18, D.Mitcheson 14 & D.Middleton 10 (Bradley Hall) 34; 18, B.Thomson 11 & D.Ford 23 (Crosland Heath) 34; 21, P.Reynolds 15 & B.Cassidy 12 (Outlane) 33; 22, G.Simpson 18 & G.Carrol 14 (Marsden) 32; 23, N.Bolam 9 & Z.Sydor 9 (Ind.Huddersfield) 31; 24, P.Kinghorn 20 & R.Pearson 22 (Bradley Park) 30; 24, G.Quinn 20 & K.Puckering 13 (Outlane) 30; 24, R.T.Owen 11 & P.Pither 11 (Crosland Heath) 30; 27, J.Smith 13 & A.Mellor 13 (Longley Park/Outlane) 28; 28, A.Kendall 23 & K.Booth 13 (Longley Park) 24.